Summertime is my favorite season. I love the extended days and outdoor celebrations that last long into the night. To keep the party going outdoors this summer, you need to light the way for your family and guests. 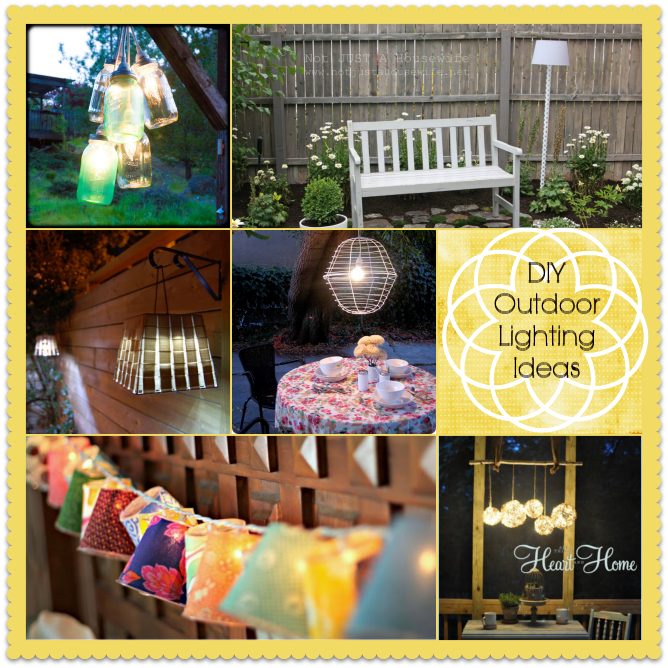 I have collected 15 easy DIY outdoor lighting ideas that anyone can replicate. Hey Beth, these are some awesome lighting ideas that can make an outdoor even more attractive and elegant. These ideas are simply adorable and inseparable. Thanks. a word to the wise, if you go for a solar route don’t just go to walmart and buy the cheap $1 lights, they will break within a week of being outside! Thanks for the tip! I’m hoping to snag some nice ones on clearance. Love all of these and have pinned about half of them already! So cool. I did some DIY lights when I first started blogging about 2 years ago and I still love them. I have changed wording to match the seasons or the occasion because it is THAT easy! Thank you for the Inspiration!! I adore some of these ideas. My outdoor spaces are in dire need of some lighting.